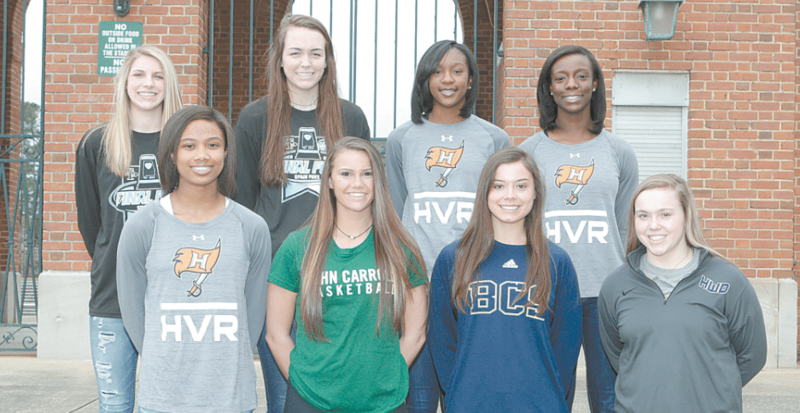 Members of the 2017-2018 All-Over the Mountain girls basketball team are, front row, from left: Joiya Maddox, Hoover; Josie Wannemuehler, John Carroll; Morgan Hutchinson, Briarwood; and Hannah Barber, Homewood. Back: Sarah Ashlee Barker, Spain Park; Barrett Herring, Spain Park; Eboni Williams, Hoover; and Jennifer Andrew, Hoover. Not pictured: Clair Holt, Spain Park; Lacey Jeffcoat, Mountain Brook; and Tori Webb, Hoover. Journal photo by Marvin Gentry. This season, the Over the Mountain Journal’s girls Player of the Year is shared by the foundation and future of what may be the state’s next basketball dynasty. Spain Park senior guard Claire Holt and Spain Park sophomore forward Sarah Ashlee Barker led the Jaguars to coach Mike Chase’s first state championship, just one year after falling in the championship game. The duo equally impressed Over the Mountain high school basketball coaches to tie in balloting for top OTM player of the year. Youth remains a bright spot for the Jaguars, with the entire starting five returned from that team. Holt scored 20 points, sparked by three 3-pointers, and she grabbed five rebounds and four steals to earn MVP honors for the 7A state tournament. She now passes the torch to Barker, who had 12 points, nine rebounds, three steals, two assists and a blocked shot in the 56-26 victory over McGill-Toolen. Both were named to the All-Tourney Team. Barker came into her own as a freshman, and she’s been making an impact on this team since. She was never intimidated. Girls coach of the year Mike Chase, Spain Park. Three starters will return next season, setting the Jaguars up to be a favorite to repeat. Just Holt and forward Barrett Herring will graduate. “We won’t have as much size as we’ve had with Barrett leaving, but I feel like we have enough experience that we will overcome it,” Barker said. The example set by Holt is something that Barker will carry with her as she now steps into a leadership role. “She was the hardest worker on our team,” said Barker. “We would scrimmage in the off-season. We’d play five-on-five or something like that and me and her would be guarding each other. We would push each other to become better. “I really look up to her work ethic. Her work ethic is unbelievable. She’d be in the gym at 9 p.m. It’s something that I noticed when I was young, and it’s something that I want to follow. Holt will play for the Richmond Spiders next season. Barker will assuredly have several college options of her own – she has seven scholarship offers as she enters her junior season – but there’s more to accomplish at Spain Park before that time comes. “I’m following one of the best players to ever come out of Spain Park,” Barker said. Barker has accomplished a lot a young age. She’s well on her way to cementing her own legacy in the same circle.